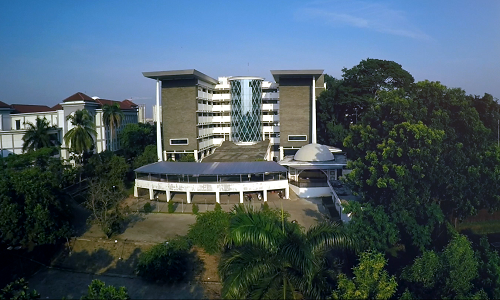 SPs Building, UIN News Online – The gap in Islamic law between the static law and a dynamic modernity with its changing continually has sparked off serious problems in dealing with actual problems that transfire continuously. Jasser Auda then offers the concept of maqashid syari’ah with a systematic approach that includes five features, namely cognition, comprehensive, openness, multidimensional, and objectivity. This approach system or philosophy system enrich its colorful of maqashid syari’ah to be more holistic, integrative and substantive. This was conveyed by Hengky Ferdiansyah, a graduate student of Graduate School (SPs) UIN Jakarta, in an open session of his thesis on Jasser Audaâ€™s Islamic Jurisprudence in SPs Building UIN Jakarta on Wednesday (14/6/2017). In the session, present as examiners Prof. Dr. Masykuri Abdillah, Prof. Dr. Arskal Salim and Prof. Dr. Didin Saefudin. In addition, there are also Prof. Dr. Atho Mudzhar his examiner and at the same time as his mentor. 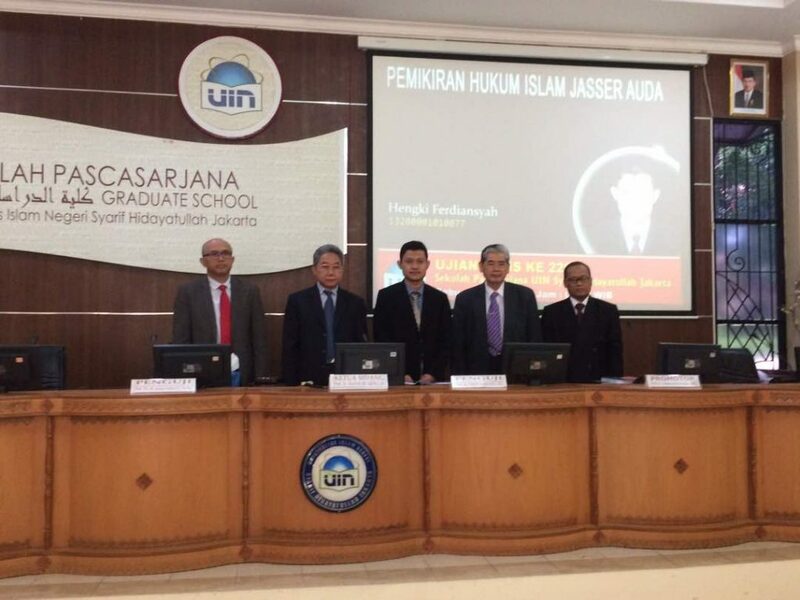 In his thesis, Hengky explains that Jasser Auda offer flexibility in Islamic law and is devoted to matters concerning muamalah or social relationships between humans, while relating to worship aspects, Jasser concept tend to be rigid and textual. “For example, when talking about hudud (criminal punishment) in Islam like stoning or cutting off hands, Jasser prefers to change the form of punishment in accordance with the positive law which applicable concerned in the country because the value of the substance for the deterrent is the same. Another example is when a woman becomes imam for male prayer, Jasser refused it because there has not been mentioned a single proposition on it, “explained Hengky who is also the editor of NU Online. Hengky, who was born in Bukit Tinggi in 1989, added that the weakness of traditional Islamic law, according to Jasser Auda, lies in the istinbath (determination) on law which is particularistic, dichotomous, and textual. “Particularistic is characterized by sufficient proof, dichotomous with classification of binary opposition such as qath’i-dzanni, muthlaq-muqayyad, while textual can be seen from the portion of lughawiyah qawa’id (linguistic rules, red.) more than itâ€™s rational rules,” he explained. 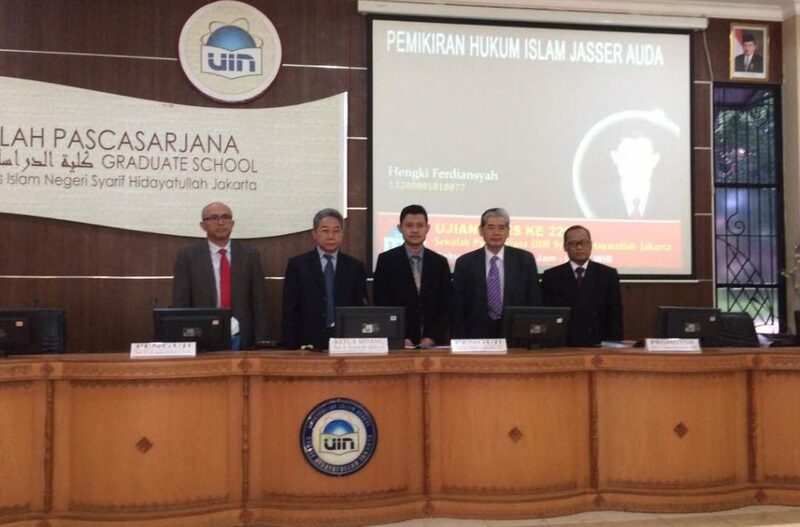 “According to Jasser Auda the use of Islamic legal theory (ushul fiqh) should refer to maqasid shari’ah. In order to comprehend the legal text, for instance, maqsad dilalah (substantive meaning) should carefully be noted so as not to ambush in its literal meaning. Among Jasser Auda methodologies are thematic interpretations. The thematic interpretation emphasize the law not only be understood by only one verse or hadith, but it needs to be interpreted and comprehended holistically and comprehensively,” Hengky explained. 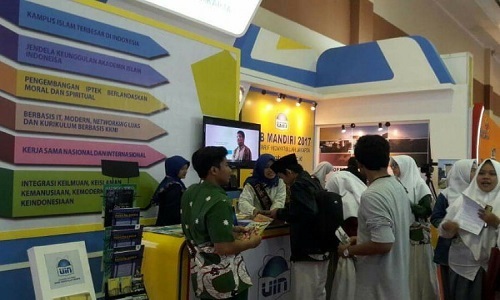 From all examiners presents at the time, all of them highly appreciate the thesis written by alumnus Pesantren Darus-Sunnah and researchers at El-Bukhari Institute. Not only appreciation from his examiners, but alsoÂ Director of SPs UIN Jakarta, Masykuri Abdillah said that this thesis is almost equivalent to dissertation. “The quality of the thesis is like a dissertation because of its extensive references and comprehensive analysis,” said Masykuri.